Spending is forecast to continue upward trajectory through 2018. 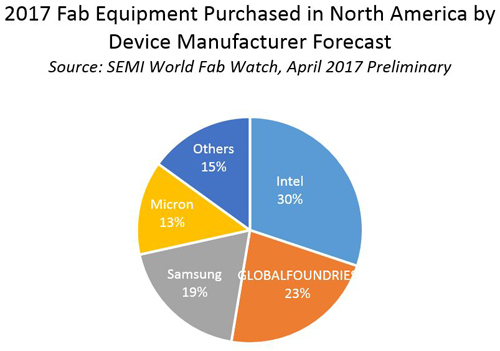 These fab equipment purchases are targeted for advanced capacity, more specifically Samsung is making investments in 10-nm capability in its Austin fab, GLOBALFOUNDRIES continues its 14nm ramp and will make its initial 7-nm investments later in the year. Intel will invest in both 10nm and 7nm, while Micron will focus on 15nm. 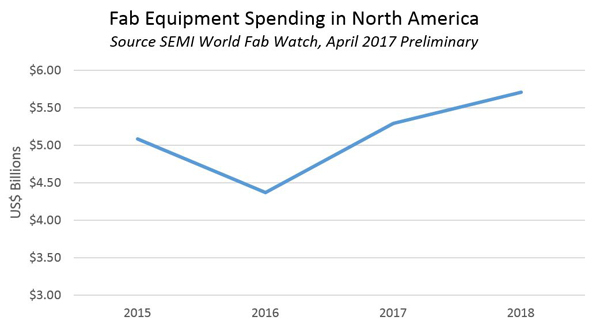 The North America fab equipment market is expected to increase about 20 percent this year and another 8 percent in 2018. As leading device manufacturers continue to innovate and invest in the region, North America will remain a critical player in both device and systems design and in semiconductor manufacturing. Plan to attend the Get Smart: SEMI/Gartner, Bulls & Bears Industry Outlook at SEMICON West 2017 on Thursday morning, July 13, for an update on the semiconductor market outlook. Portions of this article were derived from the SEMI World Fab Forecast database. This reports is an essential business tools for any company keeping track of the semiconductor equipment and material market. Additional information regarding this report and other market research reports is available at http://www.semi.org/marketinfo.